Halloween seems like the perfect time to let a skeleton out of my closet. Deep in the archives of this blog are over 700 drafts. By drafts I mean uncompleted posts. Some of them since 2008. It is sort of a digital version of that closet you don't ever open because it is full of things you knew you couldn't live without. I have been tempted multiple times to just select all of them and delete, but like the treasures in that closet they are just too good to let go of! So I thought I would try to spend a little time going through them and sharing some of the ideas I love that just got away from me. I fell in love with the broom parking sign from Diary of a Crafty Lady because we had three different witch costumes floating around the house with some fun brooms and I thought this would be a perfect use for one of them! Not to mention that Violators will be toad is hilarious! 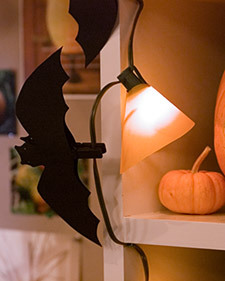 These Halloween clothespin bats from Martha Stewart are super easy, but you can do so many things with them. Close a lunch bag, make a garland, hang them from a string of lights. Bugaboo turned styrofoam cones into this fun candy corn sunburst wreath. Even if you don't want an entire wreath, the tutorial for making a styrofoam candy corn can be used for a centerpiece or mantel display too. 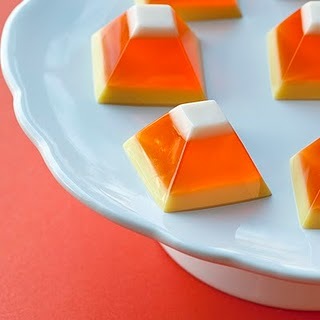 Because of my lack of love for the actual taste of candy corn, but my obsession with the fun colors, these Jell-O candy corn desserts from Jelly Shot Test Kitchen would be a fun treat for Halloween. I just need a pyramid mold! And if you love the actual taste of candy corn, these candy corn ghosts from Confections of a (Closet) Master Baker are covered with homemade candy corn instead of fondant. So there are five fun Halloween ideas down, only 721 to go! Cute ideas - so glad you dug into your drafts. I think I will make a sign for my broom. Why keep it hidden beside the washing machine when I can use it as art?